See the figure below on the right? 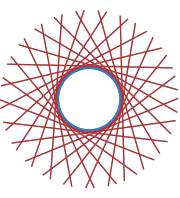 It’s called a tangent bundle, which means something to mathematicians. To me, it’s a circle with many tangents, or lines that go off in different directions. So the blog Birth Story will present stories, factoids, hypotheses and other musings that have come out of the research for my book but probably won’t appear in it. They will be interesting (I hope), relevant (more or less) and guaranteed to make us all smarter about the progress medical science has made in making it possible for women to survive difficult births. The central topic here at Birth Story is obstetrics, defined as “the art and science of managing pregnancy, labor and puerperium (the time after delivery).” For the most part, I will be investigating the approach Western mainstream medicine takes to birth. In addition to sharing stories I have come across doing research for my book, I am also looking forward to commenting on current events, reviewing the odd book and responding to readers.